The next step for me is to jack up the floor from below to a nice level shape. I went to Canadian Tire and bought 3 mini hydraulic jacks (2 ton strength) and then to Home Depot for scrap wood to start bracing the floor. 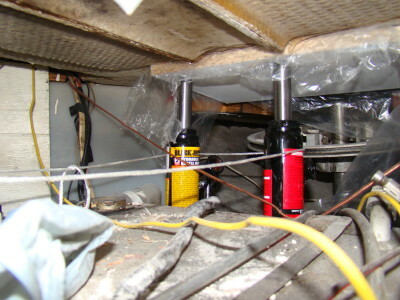 It was actually quite tricky to find suitable places for the jacks. 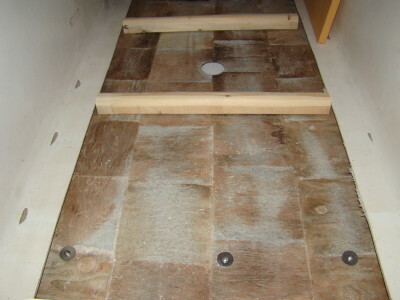 I am concerned that after the repair is finished, the floor will sag once the jacks are removed so I am now thinking of adding stringers to support the floor. 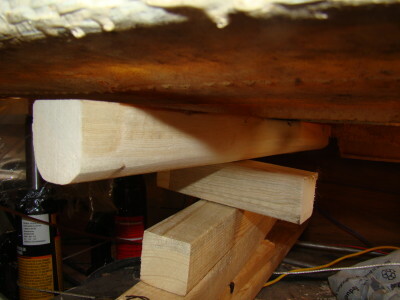 Stringers are basically a couple of wooden 2″x 2″ beams that I will glass under the floor to help keep the floor rigid. 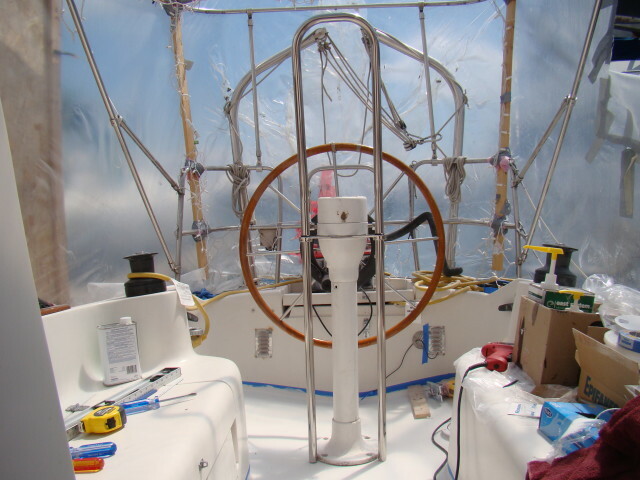 I am not thrilled with having to do fiberglass work down below in the boat.. but I don’t see how I can get around it. I first bolted the stringers in place to make it easier to fiberglass them into place. The Stringers are made out of 2×2 wood from home depot with the edges rounded out with a palm sander. Placing them in the right place and bolting them was a bit tricky with just myself. I managed to setup a pile of blocks below (sitting on the fuel tank) to keep it in place while I screwed it down. I could immediately see the floor start leveling off the more I tightened the end screws. I was very pleased how well this worked out. I should note that I used stainless steel screw/washer here just in case. After the stringers were screwed into place, the real messy work started. I used polyester resin and painted a coat all over the areas the new glass cloth would touch. 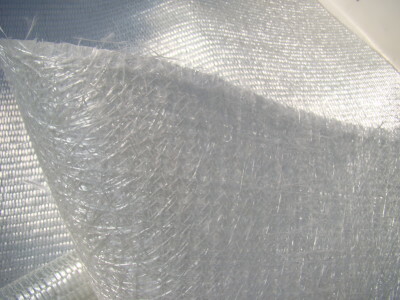 After a period of time when I felt this “hot coat” had gotten sticky enough, I prepared 3 layers of glass mat stacked and soaked through with resin. I carefully crawled back under with the 3 sheets of wet stinky resin soaked cloth and tried to stick it to the underside of the floor wrapping it around the stringers. This was a lot harder than I thought it would be. The space is extremely tiny, the resin gets everywhere, refuses to stick, and it was also getting warm working with a full face mask/overalls. The trick was to only do strips 4″ wide by 12″ at a time. Any longer and there was too much weight to the fabric for the resin to hold up against the ceiling. It eventually stayed on and it cured over the next 2 days in place. Actually one area fell off while it was curing overnight and I will have to go through this ordeal once more.. but for now I think the area is strong enough as is. I should also thank my neighbor Sven for helping me with this process. I really couldn’t have done this step without his guidance and extra helping hand. My order from McMaster Carr arrived finally at this point. 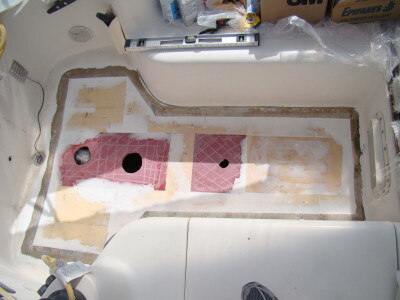 It was a 36’x12′ FRP board (fiber reinforced plastic) that I intend to use anywhere where I need added strength such as under the pedestal, diesel fuel fill cap and the rudder post port. McMaster no longer ships to Canada unless you are an existing customer so I had to ask a kind neighbor to order it through their workplace. This wasn’t cheap and another neighbor suggested I could have used a solid panel of PVC but I am glad I held out for this. So now that I have all the pieces, I need to start cutting up the FRP and the Corecell foam board and assembling it into the floor. This took quite a bit of time of measuring and sanding to get everything to fit just right. Some pieces fit right under the lip of old top skin and I had to sand carefully to make sure the pieces slid in properly. For the curve in the back of the cockpit I also decided later to slice the Corecell foam once more in half to follow the curve better. Make sure you label the pieces properly.. Even if you know each piece intimately after all the cutting and sanding you just went through. Once they are sitting in a pile waiting to be epoxied into place and your on the clock before the epoxy cures, you better know where everything goes. I drew a map down on paper just to be sure and had to check it often. I also drilled holes in them so I can see if the epoxy is gushing everywhere for proper coverage. 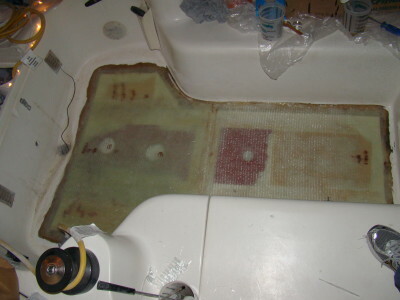 Here you can see everything I had ready for the epoxy work. Sandbags to weigh the foam down after its in place. 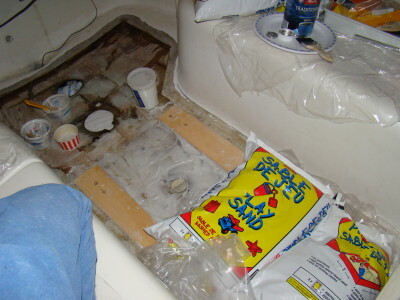 My epoxy resin/hardener (I am using the East System with the West System Pumps), plastic sheet to protect the cockpit seats, garbage bags, cups, stir sticks, fillers, putty knives, tape, acetone, quick grips, 100 latex gloves, beer and 2 sandwiches. Starting at 3pm, I didn’t finish till 1:30am but I had a good time working on this part. It was real satisfying to finally see things start to rebuild rather than take things apart. First step was to wet out the edges with epoxy. 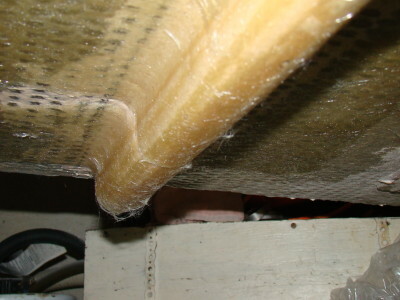 This will seal any wood left under there and prevent moisture from getting in. For some areas I found I had to really thicken up the epoxy to prevent it from dripping and running away. I ended up using a lot more filler than I thought I would. I am glad I had 2 extra containers of filler from last year laying around or I would have had to stop and continue another day. Once all the pieces were in place, I placed sand bags on top to keep the pressure down and make a good contact to the bottom skin. I bought play sand at home depot and returned it for a full refund a few days later once I no longer needed it. I made sure there was a plastic sheet between them and the floor so no epoxy would reach the bags. The next day I removed the sand bags and it looked great. I added more thickened epoxy to fill any gaps and sanded it a day later to a nice smooth surface. At this point I felt it was strong enough to step carefully onto. 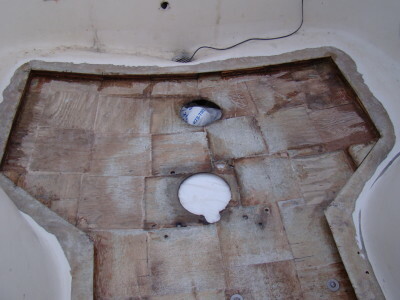 So now with the core having been replaced, I had to begin replacing the top skin of fiberglass I had peeled off. I didn’t want to use the original piece as there was so much bend in it, I was certain over time it would work itself loose from the floor. 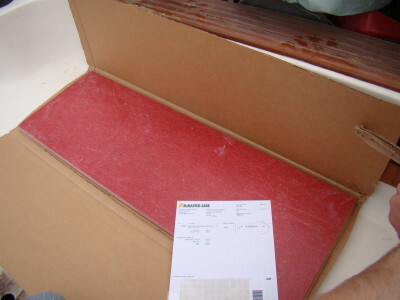 I went to Noah’s Marine and ordered enough stitch mat to cover the floor for 3 layers. 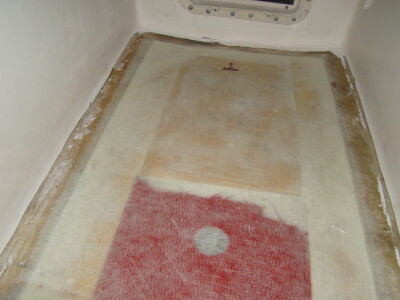 Stitch mat is a special fiberglass with cloth on one side and mat on the other. You aren’t supposed to be able to use mat with epoxy as epoxy does not break down the glue in the mat. The styrene in polyester resin would break down the glue binder and let the mat flow freely around corners. So instead you are supposed to use cloth with epoxy. However.. 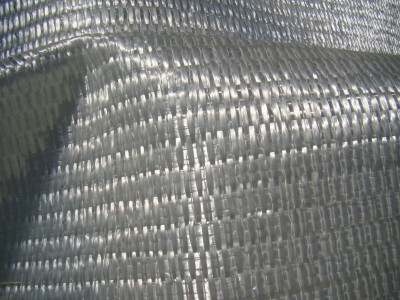 I have read you can not lay cloth down on top of cloth when building up the layers. So that is where stitch mat comes in. I bought 6oz stitch mat and prepared the pieces by cutting them to size. I got a bit creative with my pieces as I wanted a few extra layers to build up a thicker layer to compensate for the floors uneven angle. I figured an extra cloth or two will level the floor just right for the pedestal. I think I ended up over building the floor but I think that is a good thing. It was really hard to cut a nice clean line. Perhaps I should have bought some better scissors but I found the mat layer cut very rough and the cloth layer unraveled creating uneven edges. I found this didn’t really mater once it was all soaked in resin though. 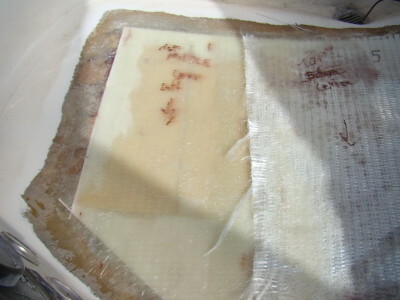 This photo shows my first couple pieces of fiberglass soaked in resin. I drew an arrow on every piece so that I knew how they fit together as well as numbered them. You can see the left side has a properly soaked through cloth with no air bubbles. It takes a bit of time but with epoxy you have a fair bit of time to work out the air bubbles and get a solid layup. The cloth on the right side was just laid down and I am just about to pour more epoxy over it. I found the best method was to use a small roller to wet out the area, and a metal roller to work out the air bubbles. You can also see the stray strands on the edge but they basically disappear once wet out. The only problem I ran into was that I was running low on hardener. I had another half can of West System epoxy resin leftover from an earlier project but after googleing it extensively I decided against mixing brands. It turns out 2 layers of the 6oz cloth is more than enough. I was upset I couldn’t get a third coat on there but felt better after an employee at Noah’s Marine suggest even a single layer would have sufficed. It was also quite late at this point, around 1am and I was exhausted from a long day of glassing. It was hard to see if I had worked out all the air bubbles and I kept thinking those white hazy areas were massive air bubbles. 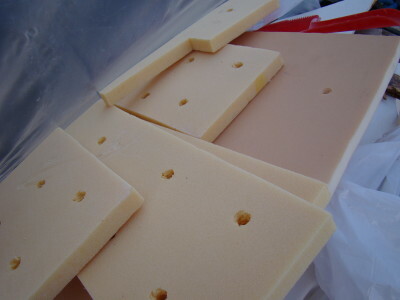 I only realized the day after after a good nights rest and the bright daylight that it was simply the thickened epoxy I had used on the foam core that was showing through the fiberglass. Perhaps the fumes were getting to me and I wasn’t thinking right. Anyways I was relieved the next day when I figured it out. 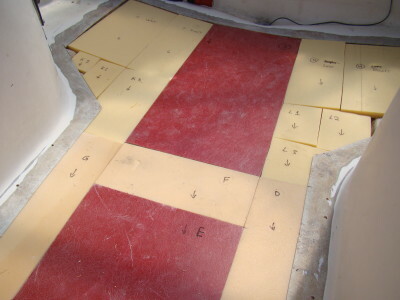 Floor fiberglass skin finished glassing. Job well done, time for bed. The next day the floor eventually cured to a point I could step onto it. It was great to finally see my floor back together and feel sturdy under foot. The next step would be to mix up even more epoxy and thicken it up so that I can fair the bumpy floor texture down to a nice smooth surface. 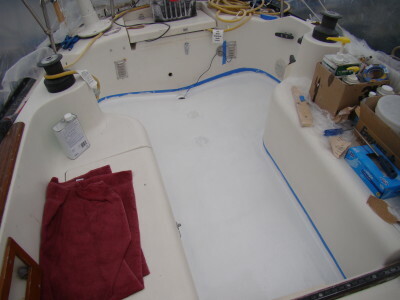 Thickened epoxy layed over the bumpy fiberglass. Again I had to wait a day for this to cure. I sanded this down smooth and realized that I need to add another coat in certain areas. I also realized that the edges where the floor and vertical sides meet were a little sloppy. I mixed up a thick batch of epoxy and created a curved filet. This actually was a little more difficult than I thought it should be. The temperature under the plastic lately was getting quite warm (30 degrees Celsius). I had to work quickly before the epoxy got too thick to work with. After everything cured.. yet again.. it was time to sand yet again.. I tried to make a nice clean edge with the blue masking tape and rolled on the first coat of 2 part Interlux Epoxy Primer paint. Actually I missed a step. 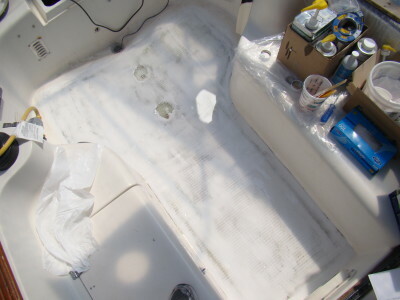 Before I could paint, I used Interlux fiberglass prep to de-wax the areas of the floor that were still gelcoat. I then sanded any of the gelcoat areas with rough sandpaper to better facilitate the primer to stick to it. It is a bit trickier to use than other products as you have to mix the main paint with the catalyst to a specific ratio and then thin the mixture down with solvent. I believe I used the the ratio 6:2:1.5 (Paint:catalyst:233N Solvent). Overall though it wasn’t very hard. But good lord that smelled awful. I decided it wasn’t safe for either my cat or myself to live on the boat that night so I dropped off my cat at my parents and I stayed the night at my girlfriends. The next day I sanded it down smooth and painted a second coat on. Edson pedestal and new guard rail dry fit. It looks fairly straight. Yay! I wanted to apply the paint and nonskid but the paint I will be using is Perfection 2 part polyurethane paint from Interlux. I plan to add a texture additive for the non-skid areas and a flattening agent to cut the glaring shine in the cockpit to a nice satin finish. Well that is the plan anyways but it turns out all the local shops don’t have the flattening agent in stock. It will take 3-4 days before that arrives and in the mean time I figure I could start drilling holes into the floor for the pedestal mounting. I want to leave a nice 1″ trim around the pedestal of regular paint (not non-skid) so I will need to drill the holes now so I know where to tape up. I spent a long time measuring and thinking and when I finally thought I had the pedestal right, drilled in the holes for the bolts. I was happy to see the new base plate /idle wheel for below the floor lined up perfectly with the pedestal bolts. The new pedestal guard is much taller than my old one but I need the extra room to mount electronics such as the Raymarine A50D Chart Plotter I had purchased. I would also like to send the pedestal base in to get sand blasted and powder coated but I am in a bit of a time crunch and will have to live with perhaps just slapping a coat of Perfection paint by brush. 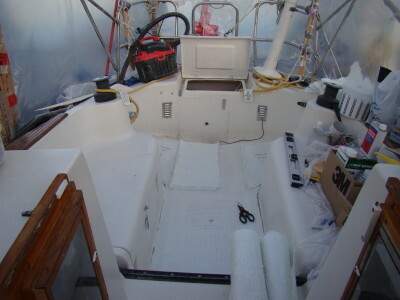 I only have another week until I have to move my sailboat from my winter slip to my new summer slip so I need to wrap this project up. 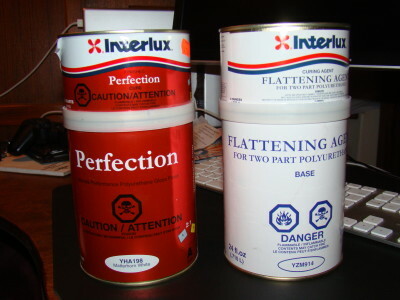 The paint I am using is Interlux’s Perfection (2 part polyurethane) paint. This is a very durable paint and also very pricey. There are cheaper and easier products to use from Interlux where there isn’t any mixing required but from what I have read, the 2 part paints hold out much longer than the 1 part paints. The documentation and presentations I have seen of this paint suggest that it will flow out and level itself out as you roll and tip the paint on giving you a mirror perfect finish. Well I have to say that for me, that was not the case. It was very hard to not get brush strokes visible when painting. The mixing of the paint was a real pain as well. First I had to mix the paint 2:1 ratio with the hardener, then the flattening agent was mixed with its own hardener at a 3:1 ratio. The two mixtures are then added together at a 1:1 ratio for a semi-gloss finish. Thinner is then added to let it “flow” better and I suspect that is where I need to work on to get a better finish happen. With all of this mixing I burned through crazy amounts of measuring cups, mixing sticks, paint trays, foam rollers and expensive brushes. I really did not enjoy this stage of the project. It actually scared me away from painting the rest of the boat. 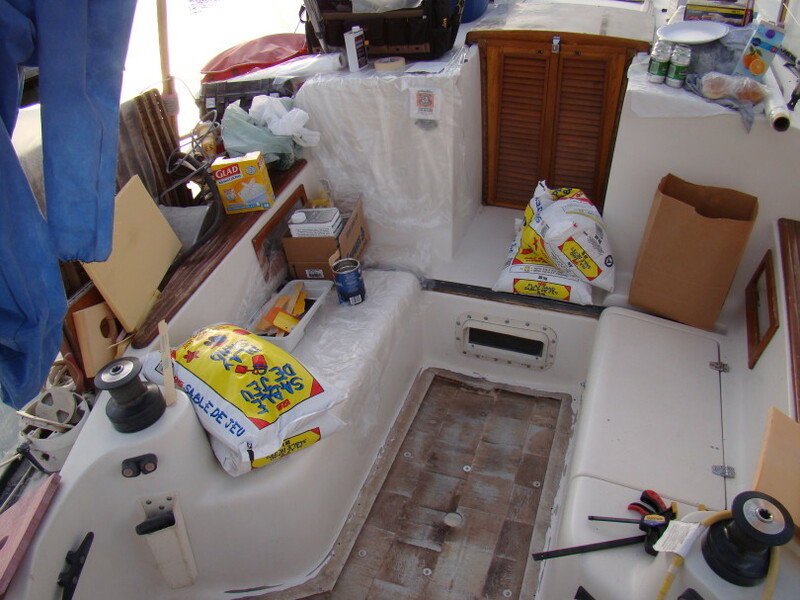 I would rather prep the boat and hire professionals to spray the boat than go through this ordeal again.